Cilantro is an annual herb most often seen in Mexican, Southern and Central Asian, Middle Eastern, African, and Indian dishes. It was cultivated in Greece at least 3,000 years ago, has historically been used for culinary and medicinal purposes throughout Europe, and was brought to the New World in the late 1600s. Every part of this flavorful plant is edible, including the leaves, stems, roots, flowers, and seeds. Cilantro – also called coriander or Chinese parsley and technically known as Coriandrum sativum – is used as both an herb and a spice. When using the leaves, this herb is generally referred to as cilantro; whereas, the seeds, which are used as a spice, are called coriander. Here in Southern California, cilantro leaves are a salsa-making staple and, for those of us who enjoy making fresh, homemade salsas for dinner parties or movie nights, it is a must-have plant for your herb garden. It is easy to grow, harvest and use. The trickiest part to successfully growing cilantro is trying to keep it from bolting as soon as the temperature rises. 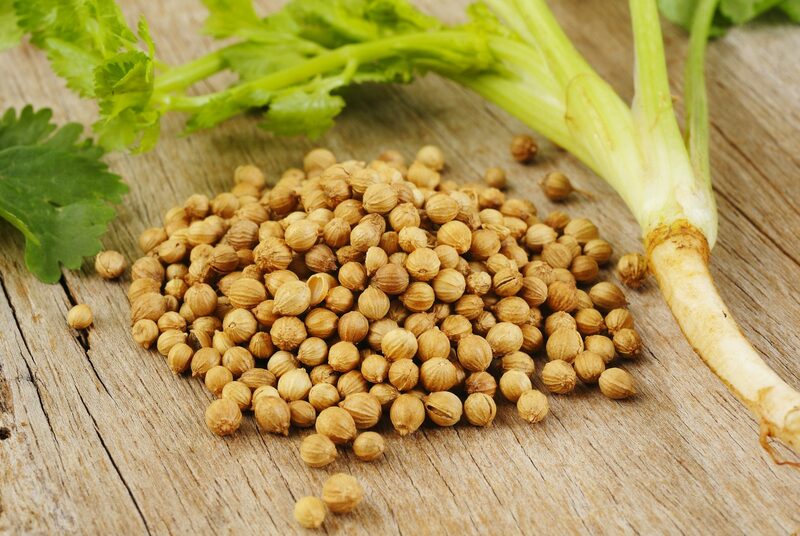 But even if it does go to seed quicker than you would like, you can simply collect the coriander seeds for use in cooking or to add to your seed stash for next year’s garden. There is no need to start cilantro seeds indoors for later transplantation to your garden. In fact, cilantro plants prefer being started directly in the ground or container where its taproot will remain undisturbed. This means that you can easily start cilantro from seeds, which is usually the least expensive way to add this herb to your garden. When growing cilantro from seeds, mix compost into the soil, sow your seeds about one-quarter inch deep about every six inches in rows that are approximately one foot apart. 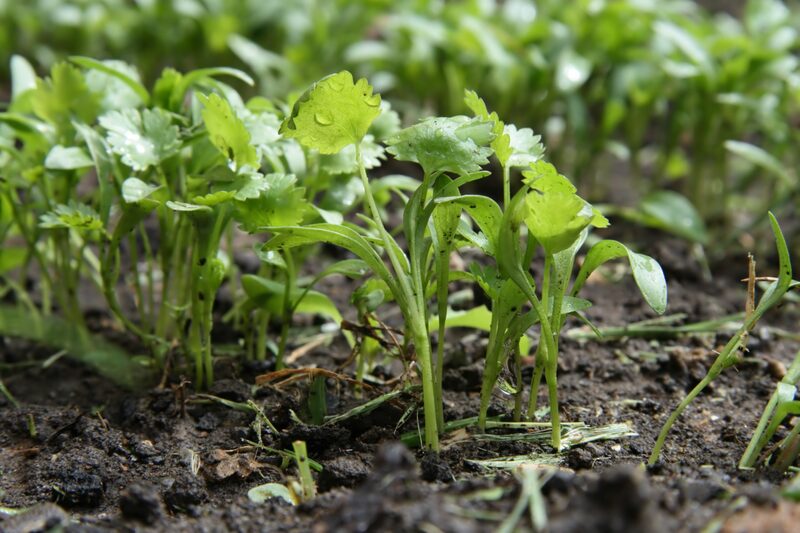 Remember that your cilantro plants may bolt when it starts getting hotter, so it is best to sow seeds in early spring and, if you want a longer harvest, be sure to undertake multiple plantings about two weeks apart. In temperate regions of Southern California, you can also plant cilantro in fall or winter, since it can withstand some cold and makes a great addition to fall and winter gardens here. If you do not want to wait for seeds to germinate and develop into a usable plant, you can also purchase young cilantro plants at your local garden center to transplant into your garden. This is usually more expensive than purchasing seeds, but you do get to enjoy fresh cilantro faster with this option. 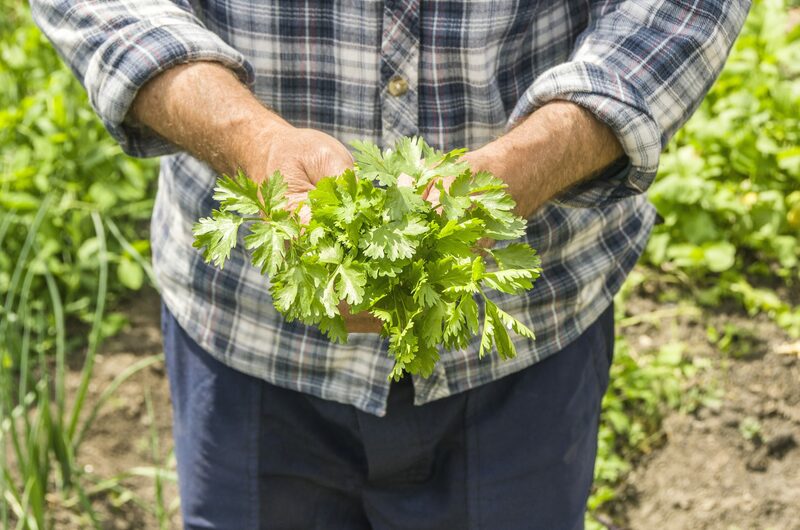 Your third option for starting cilantro plants is to save a few stems next time you purchase organic cilantro at the grocery store or farmers market. Place these stems in a glass of water on a sunlit windowsill. Once they have developed roots that are at least two inches long, plant the stems in your garden or a flowerpot and watch them grow. If you use either of these methods for growing cilantro, mix compost into the soil before planting them, and place your plants about eight to 12 inches apart in rows that are about one foot apart. Cilantro prefers well-draining soil in full sun or light shade. It can be grown in a flowerpot on your kitchen windowsill, in a vertical herb garden, in raised garden beds, in containers on your patio, in landscaping borders, or directly in the ground in your vegetable garden. As long as you find a spot with adequate sunlight, you will find that you can grow cilantro just about anywhere. If you are hoping to continue harvesting your cilantro into early summer, the ideal location is one that is shaded during the hottest times of the day to try to keep the soil temperature down. This, along with keeping the soil moist on hot days, will ward off bolting at least a little while. Bonus Tip: If you are also planting parsley in your garden, keep in mind that they are practically twins. Therefore, you will either want to mark your rows well so that you know which is which, or you will want to grow them in separate sections of your garden to avoid confusion. When growing cilantro from seed, keep the soil consistently moist until the seeds germinate and you begin to see little seedlings peeking through the soil. Once you have small plants, you can cut back on the irrigation a bit, but your cilantro will require regular watering to keep the soil moist. Side dress your plants with compost about once a month or so to add nitrogen to the soil, which will allow you to avoid using more-expensive fertilizers to feed your plants. Because of cilantro’s short life cycle, most gardeners do not experience many problems with garden pests or diseases. If you do have a pest issue, it will most likely be aphids, but the issue you are most likely to have – if you have any – is powdery mildew. To avoid this, water early in the day and make sure you are irrigating your plants near the ground so that the water is reaching the roots without getting on the leaves. A drip system can help with this. Bolting is an issue with cilantro, so you will need to stay on top of pinching off any stem that looks like it is about to reach for the sky and flower. You can accomplish this by regularly harvesting stems and leaves for use in salsas, salad dressings, and other dishes and paying particular attention to any stem that looks like it is getting ready to flower. Cilantro is easy to harvest; all you need to do is pinch or cut off a few stems at a time to use in your cooking or meal preparation that day. If you pinch off small amounts regularly, it will keep the plant’s energy directed to making new leaves and will help stave off going to seed at least a little. Once you have harvested your stems and leaves, you can either use them fresh (which is best) or dry them for use during the summer when it is too hot to successfully grow fresh cilantro in your garden. Just know that dried cilantro has almost no flavor, so you may find that it is not worth the effort to dry and store cilantro. You are better off freezing it in ice cubes and storing it in the freezer to be thawed for later use. No matter how often you pinch off flower buds or harvest cilantro for use in the kitchen, your cilantro is still going to go to seed as soon as it gets too hot. When this happens, you can allow the coriander seeds to dry on the plant, and then harvest them to use in curries, breads and soups, or you can leave the seeds to allow the cilantro to self-sow for the next growing season. 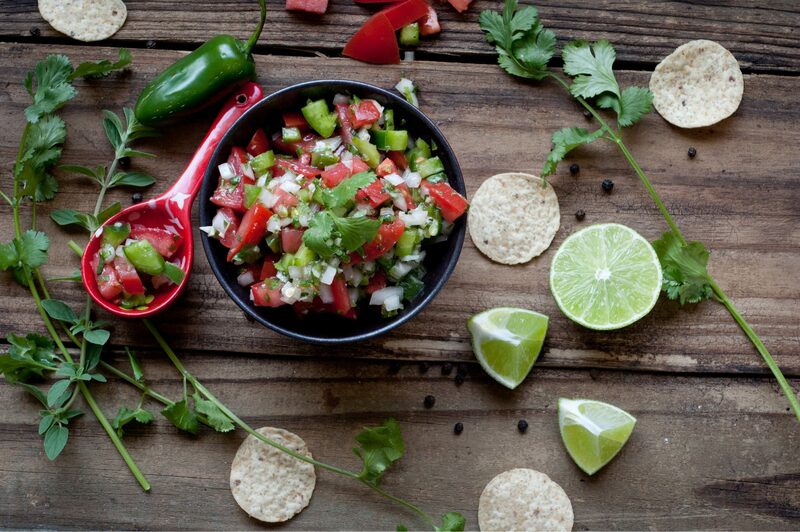 Here are two easy recipes to help you get started on using fresh cilantro from your garden. Chop and mix all ingredients. Serve fresh. Place ingredients in a blender and blend for two to three minutes. Strain out solids and store in an air-tight jar in the refrigerator for up to one week.